The more my interest in photography grows, the more I see the world differently. For example, what was once an ordinary leaf becomes a beautiful subject in just the right light or setting. An insect that was once a nuisance, can add interest or even humor to a photo depending on how it’s depicted. One of the things that once put a damper on my day, before picking up the camera, was a brewing storm. A storm on the horizon usually meant cancelled plans and confinement to indoors until the weather improved. Fast forward to the present. I’ve seen so many dynamic photos with beautiful storm clouds (never thought I’d say those words). 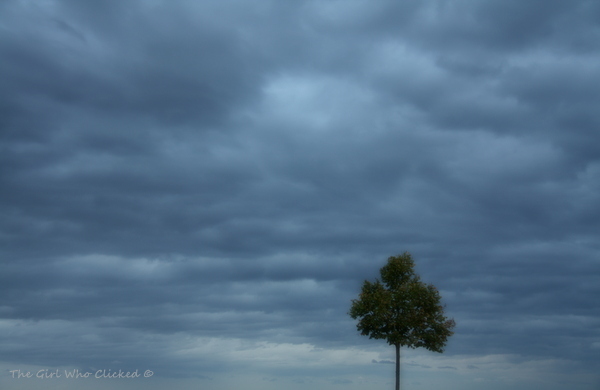 Now when I see dark clouds, I yearn for a chance to capture them at just the right moment. I playfully refer to the photographers who take these amazing photographs as Storm Chasers. I’m happy to report that I received my “storm cloud” opportunity this week. What’s interesting is that the day began bright and sunny without any signs of a storm looming. As the day wore on, the skies grew darker and darker. I have to be honest, I was a little disappointed initially because I had another idea for a shot in mind (sans storm clouds) for this challenge. However, I happily and quickly realized that I too could be a Storm Chaser!